For me, there is nothing better than cherries. And this is time for them. After spending about $100 on cherries at this week’s farmers market, both sweet and my baking favorite sour cherries, I have spent the last few days pitting nearly my body weight in fruit. My hands look awesome, like a serial killer as my son put it. 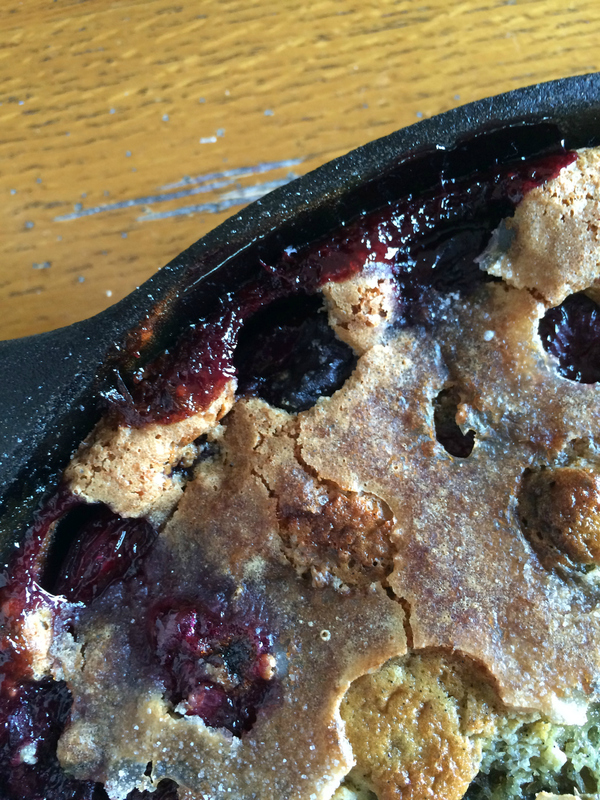 Aside from just eating them as is, this my simplest and most delicious way to bake with sweet cherries. 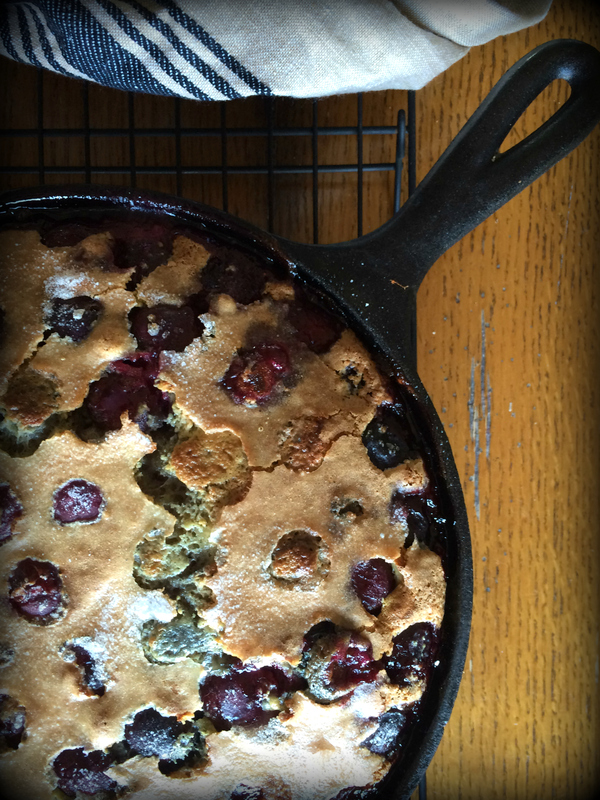 A clafoutis is really most similar to a baked French custard I suppose. Think of it like a baked big pancake or crepe. It has a light texture and is delicately flavored with lemon zest and vanilla bean, which allows you to really taste your summer fruit. Heat the oven to 350 and butter a cast iron pan or a 13×9 baking dish, whichever you have. In a large bowl, combine the egg yolks and 1/3 cup of the sugar. Beat on medium speed with a hand mixer until it is light and increased in volume, about 8 minutes. Add the flour, vanilla and cream. Reduce the speed to low and beat until completely blended, stopping the mixer occasionally to scrape down the sides of the bowl. Beat the egg whites and salt in a separate bowl on high for about 30 seconds. Add the whites to the batter and beat with the mixer on low speed until incorporated, 1 to 2 minutes. Preheat the prepared baking dish in the oven for 4 to 5 minutes. In a bowl, stir together the cherries, the remaining 1/3 cup sugar and the lemon zest. 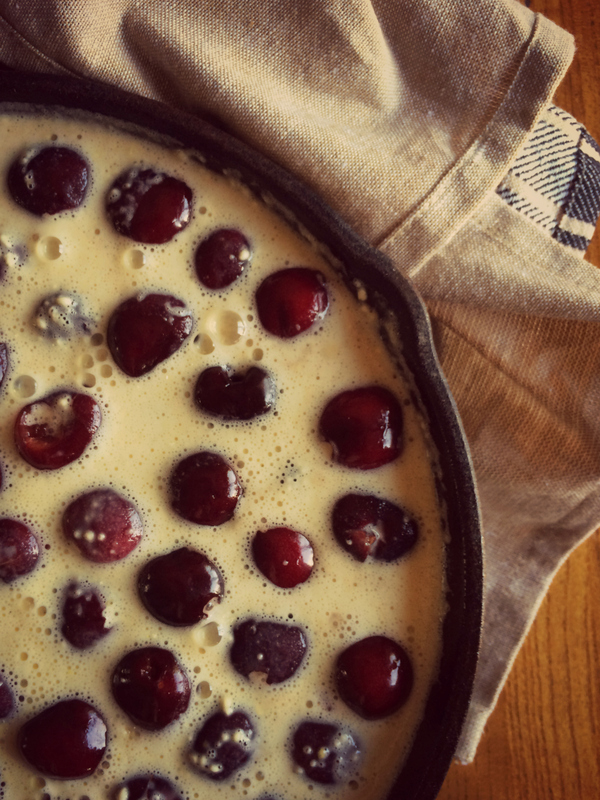 Remove the pan from the oven, pour in the cherries and top with the batter. Bake until the clafoutis is set in the middle, 35 minutes. This tasted as good as it looks. One of my favorite desserts!